For the past three days, I have been watching men in my driveway dig deeper and deeper into the earth. It has something to do with an underground power line that has been defunct for a better part of a year. The problem in getting the line fixed is that it’s buried below more than four feet of earth. An even greater obstacle is that there happened to be a heated driveway on top of that. Think of the heated driveway as an incredibly expensive, complicated crust placed on top of a pie. 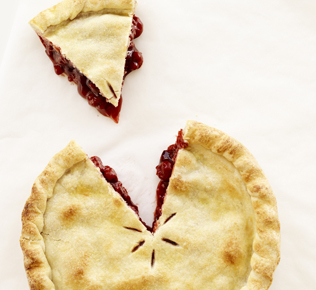 It’s summer and somehow easier to see a pie metaphor from June until September. So the men have been excavating underneath the heated driveway, delicately, nearly tunneling their way out of the light and into the secret depths of the earth. Think of trying to locate a spicy whole clove in the center of a just set peach pie, by digging into the side of it, but making sure that you never disturb the perfect golden crust just centimeters above your spoon. Writing can be just like this—the delicate searching for an ideal word, image or phrase just out of grasp. A blind reaching into the dark after something that we can only sense somewhere ahead of us. So often, for me writing is a stretch or leap into the unknown, a wrestling with an angel in the dark. Let me be clear that not all (or even the majority) of my poems are angels, fallen or otherwise. But it is rare that I ever see my opponent clearly. Sometimes writing can be an act of excavation. Only after going deeper and deeper do I finally catch a glimpse of what I was digging for. In the case of the men outside, it was a snarl of black utility lines that looked so much like a clustering of black snakes, eager to slide out of reach of the shovel. There are times when I am so frustrated, dirty, and fed up with writing that I want to throw the shovel into the ditch and bury the whole project. Nevertheless, somehow, I always keep on digging, if haltingly toward my goals. While at the Port Townsend Writers’ Conference, another poet asked me why I wrote poems, why not some other genre. The answer I gave him was immediate and without thought, “Poems allow me to access my inner life.” My certainty surprised me. Poetry, after a handful of years, has become the way in which I make sense of my inner and outer world. It is the eye through which I order my universe. A poem usually begins as a question or conversation that I am having with myself. The words and images arise from that unmappable center I call the inner life. Others may call it the unconscious, the higher self, the muse or the soul. It is the deep place where the sable snakes lie slumbering in the dark. It is a single clove in a recipe that has scented your entire home. That is where my writing, at its best, comes from and it takes a spade, a shovel, and a hell of a lot of sweat to get there.